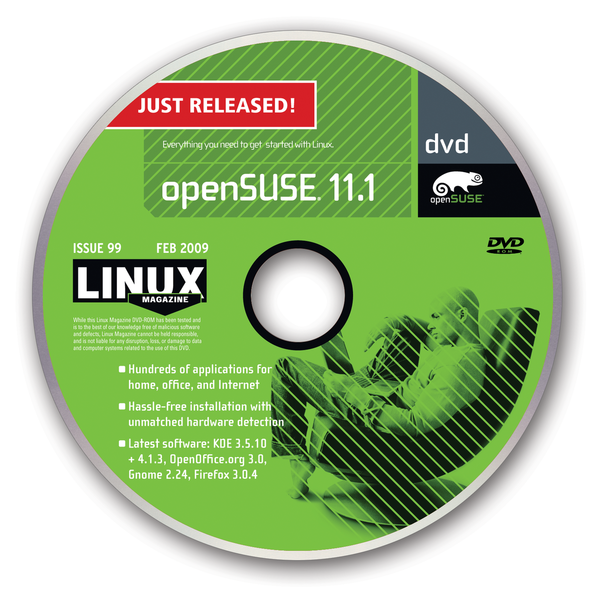 Your February 2009 issue came with a DVD of openSUSE 11.1. "As required by US law, you represent and warrant that you: (a) understand that openSUSE 11.1 is subject to export controls under the US Commerce Department's Export Administration Regulations ("EAR"); (b) are not located in a prohibited destination country under the EAR or US sanctions regulations; (c) will not export, re-export, or transfer openSUSE 11.1 to any prohibited destination, entity, or individual without the necessary export license(s) or authorizations(s) from the US Government; . . . . . . . ."
"If any provision of this agreement is held to be unenforceable, that will not affect the enforceability of the remaining provisions. This agreement will be governed by the laws of the State of Utah and of the US, without regard to any conflict of laws provisions, except that the United Nations Convention on the International Sale of Goods will not apply." OpenSUSE 11.1, to me, is essentially a well-packaged bundle of free open source software that is covered by the GNU General Public License. I wonder whether the Novell people may be breaching the terms of the GNU General Public License by slapping an additional EULA on top of it. At best, it fits poorly with the spirit of the Free Software community. I would welcome Jon 'maddog' Hall's take on this. Further, does Novell really expect me to acknowledge any alleged extraterritorial powers of the US Justice or Commerce departments, or expect me to ensure that my country doesn't get onto some list that, in my understanding, can be changed anytime at the whim of the US Government of the day? Your readers may like to have a close look at the fine print of openSUSE's EULA. Some, like me, may feel more comfortable with an open software distribution that is simply covered by the GNU General Public License. OpenSUSE might be an excellent distribution, but fortunately it is not the only one. We provide openSUSE as a DVD option because it is an important Linux distro and many of our readers are interested in it in spite of its EULA restrictions. We agree that EULAs are increasingly becoming an issue throughout the open source community. Unless you have your own lawyer on staff, the best approach is to read the EULA carefully and make sure you agree with everything in it – don't click the ACCEPT button unless you are OK with all the provisions. If that means you don't use distros that use EULAs, that can only help pressure Linux vendors to reverse this trend. On November 26, 2008, openSUSE's Community Manager, Joe "Zonker" Brockmeier, announced changes to the licensing agreement. "We're happy to say that you'll be able to enjoy openSUSE 11.1's final release without clicking through a EULA at all," he says. Zonker also says, "This is not a EULA, it's a license notice," and he links to the new license, called "LICENSE AGREEMENT openSUSE 11.1." We noticed that the clauses that concern you are still a part of the agreement.